Source: Dr. Sopon Pornchokchai, President of Agency for Real Estate Affairs Co.Ltd. Dr. Sopon Pornchokchai, president of Agency for Real Estate Affairs Co.Ltd., presented the 2018 Bangkok Housing Markets Outlook on Thursday 25th January 2018 at the S31 hotel, Bangkok, Thailand. Agency for Real Estate Affairs Co., Ltd. has been offering real estate data and analysis in Thailand since 1994, with our aim to help our clients and the public make a well-informed decision. Our data are not acquired from any agencies or developers but a field collection, in order to ensure the integrity of our data and information. Our AREA research department collects housing data quarterly by visiting every active housing project in Bangkok Metropolitan Region (BMR) and other areas all over Thailand. The data is then analyzed and presented half-yearly as a first-handed information to our clients all at the same time. Real estate bubbles in 2018? In 2017, we have visited over 1,949 active housing projects in Bangkok Metropolitan Region (BMR). The figure is higher than 1,837 active housing projects in 2016. 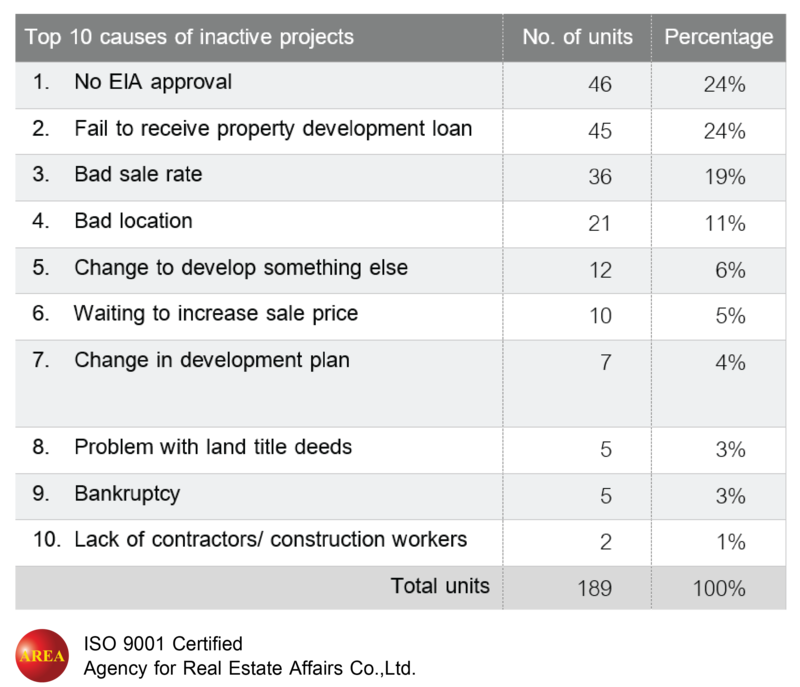 Within this number, 66% of 1,949 active projects in 2017 have at least 20 units remaining, compared to 68% of 1,837 active projects in 2016. Whilst number of newly-launched projects remain unchanged, it indicates a slowdown in sale rate which leads to an increase number of remaining supply. 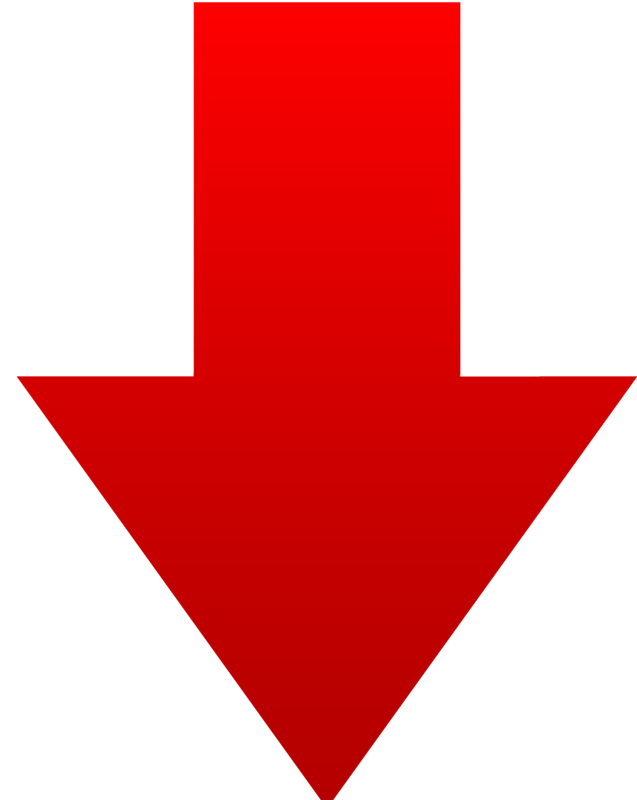 Newly launched projects fell by 11.3% from the last year. The figure decreased by 51 projects to 402 newly launched projects in 2017. 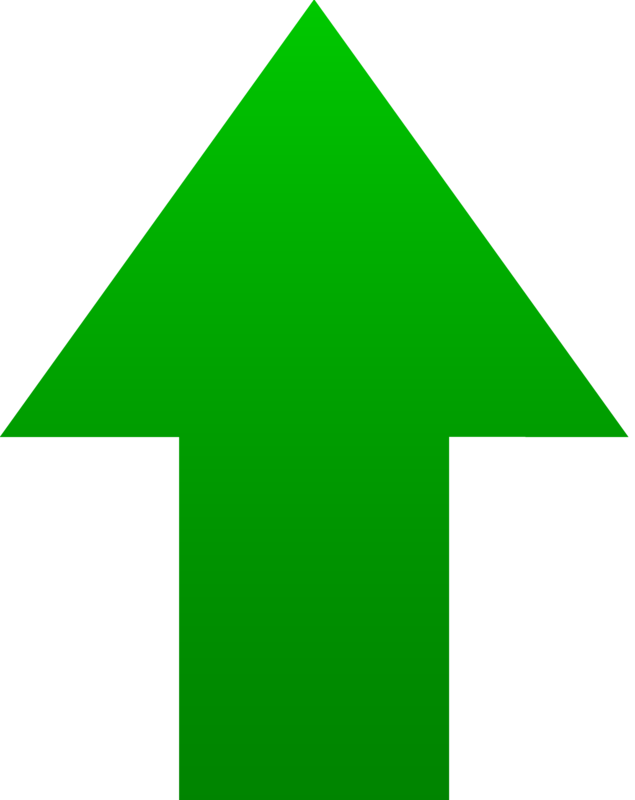 ​ Newly launched units increased by 3.9% from last year. The newly launched units increased by 3,900 units to 114,447 units in 2017. At this rate, it does not significantly affect the market condition. Market value reached the highest value ever recorded since 1994. The total housing projects value surge 15.6% higher than last year. It has increased by 59,511 million baht to 441,661 million baht in 2017. 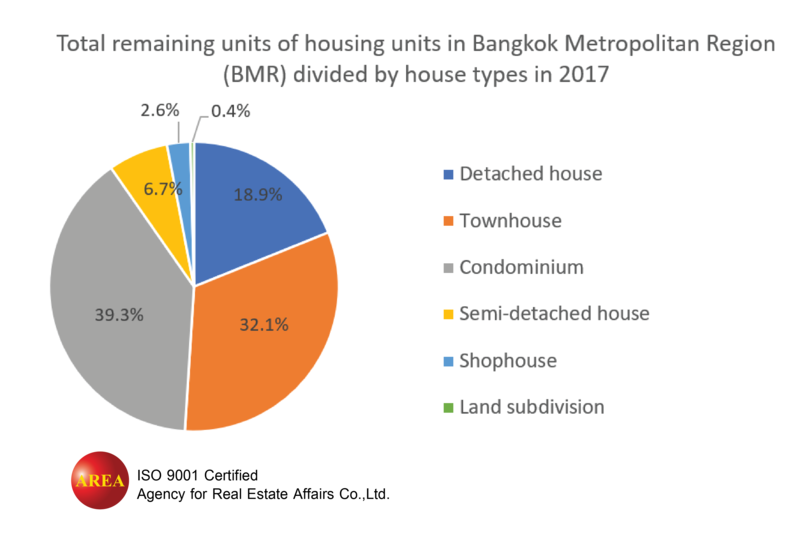 The condominium market which has the biggest share of the remaining housing supplies in BMR will continue to grow in 2018, due to the higher demand for condominiums near the Mass Transit station. Although reservation rate does not represent a sale rate due to the uncertainty of buyers and the development of the projects, it indicates a potential sale rate. In 2017, we estimated the reservation rate of 103,579 units which increased by 5.5% from the last year. Although the figure indicates a steady condition of the market, it does not represent a significant growth. As the reservation rate is still lower than 114,447 newly launched units in 2017, leads to a constant growth in the remaining units. Remaining units indicate units available in the market including the newly launched units which have not been sold yet. Although it does not represent the unsuccessful sale rate of the project, as there are many reasons for withholding the project sale for a period of time. In some cases, the developer may want to hold the selling process, in order to boost the sale price. Therefore, remaining units acquired during the data collecting period cannot represent the unsuccessful rate of the projects. However, it can represent the overall supply and demand of the market. The remaining unit is one of the important indicators to evaluate the market condition that should not be ignored. As newly launched units grow steadily from year-to-year but the remaining supply continues to surge, it could represent a sign of the lower demand than the growing supply. In 2017, AREA has found 5.9% increase of the remaining units, from 184,329 units last year to 195,227 units. Whilst the sale rate of 35% has remained steady from last year with 103,579 sold units of the total market supply. At this rate, it will take almost 2 years or up to 23 months for the market to absorb the remaining housing units without a launch of new projects. Inactive projects represent those abruptly stop their sale. It is one of an important indicator to evaluate the fall of real estate market. Our research team presents an increase of inactive projects half-yearly, with the latest data from Q2-Q4, 2017. In Q2, 2017, we found 179 inactive projects, 45,499 units with 117,984 million baht worth. 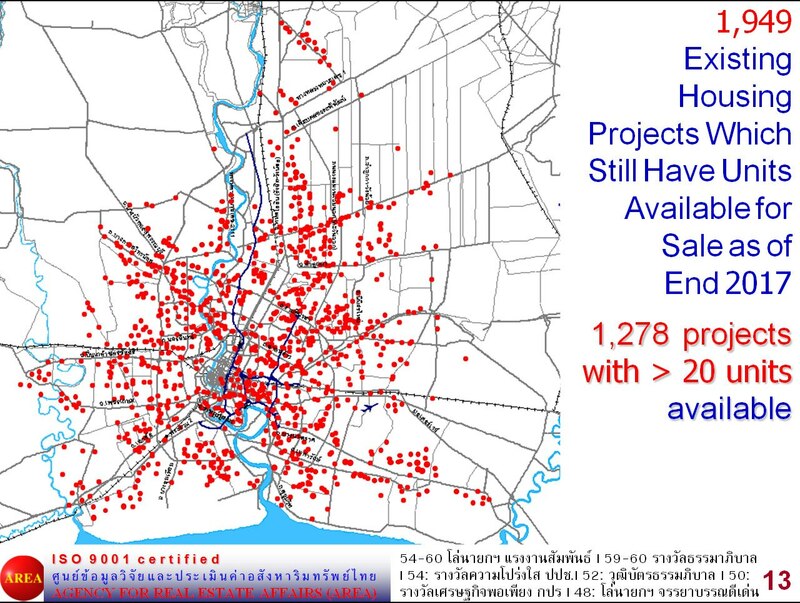 The number increased at the end of the year to 189 inactive projects, 50,799 units with 131,925 million baht worth. Although the rate is quite high during the period of half-year, it does not significantly affect the market. No.1: Pruksa Real Estate PCL. The biggest company which has always launched the highest number of housing units and project value for the past 10 years. In 2017; it launched 54 projects, 19,874 units with 51,504 million baht in value. It makes 17.4% of the market unit supply and 11.7% of the market value. No.2: AP (Thailand) PCL. Although the company launched half the number of projects and units of Pruksa Real Estate PCL, it had almost an equal amount of property value. In 2017, it launched 27 projects, 10,150 units with 50,590 million baht in value. The average unit price is around 5 million baht, double the value of Pruksa Real Estate PCL which remained around 2.5 million baht. No. 3 in terms of unit: L.P.N. Development PCL. It has the third highest number of newly launched units in 2017 or 6,336 units with 16,485 million baht in value. The average unit price is around 2.6 million baht. No.3 in terms of value: Ananda Development PCL. It may launch slightly less number of units than L.P.N Development PCL or around 6,222 units but the total value of their projects is as high as 36,494 million baht. Real estate development companies which launch high-value projects are having higher revenue and market share due to the stronger demand for high-end properties. Also, the growth in demand for condominiums along the mass transit station will have a significant effect on the role of big real estate development company. As the land acquisition cost around the mass transit station continues to surge, non-public developers will not be able to compete with the big one. Thailand economy was strong in 2012 with the 7.1% GDP growth from the last year, causing real estate market to grow significantly. However, from 2013 onwards, the number of remaining units and newly launched units remained unchanged. This represents a steady growth in the housing demand around 110,000 units per year. Nevertheless, the trend started to change in 2015, the property value increased significantly while the launched units remained the same every year. In the same year, luxury cars had higher sale rate than ordinary cars. This trend represents less purchasing power in the lower-income and middle-income while the purchasing power of the upper-income remains strong. Despite the drop in total market value in 2016, the average housing price during 2015-2017 remained around 3.5 million baht/unit which is significantly higher than the average of 3 million baht/unit during 2011-2014. In 2018, the housing market is estimated to follow the same pattern. Newly launched units and remaining units will grow steadily at the same rate while the unit price continues to surge, as the high-end housing continue to have better sale rate than the lower-end projects. An uncontrollable supply, a risk of big developers’ reliance on corporate bond which offer lower cost for property development. If housing demand happens to shrink one day, they might not be able to pay back the bond. The growing number of remaining supplies in the market which can take up to 23 months to absorb although there are no newly launched units. If there happens to an economic crash, this number may grow a lot more. AREA suggested the need of supply management, in order to avoid any unfavorable oversupply situation. Compulsory escrow accounts to all projects launched must be applied to control the supply and to protect the consumers. 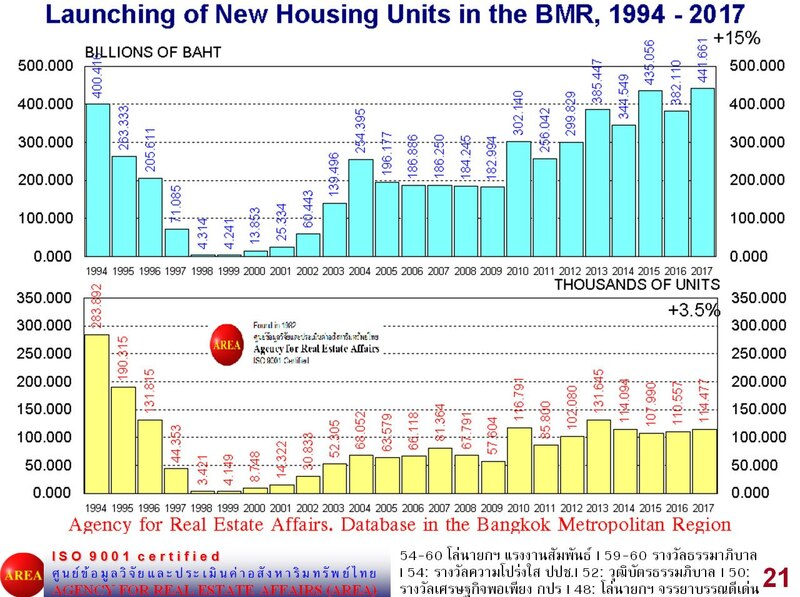 This action could enhance consumer’s confidence which then help boost the demand for housing in Bangkok Metropolitan Region (BMR).